It’s an exciting time when your child starts losing teeth, but if you’re anything like me, there is also a slight fear that the tooth fairy will not be able to find said tooth under the pillow. Enter the Tooth Fairy Bag. My eldest daughter is very much in the season of losing teeth, and my husband and I have had to deal with the question of where the tooth resides between falling out and the tooth fairy exchanging it for money. I was very much in the ‘glass of water beside the bed’ camp, whereas he is firmly of the opinion that the tooth goes under the pillow for the fairy to collect while our daughter sleeps. These great Tooth Fairy bags from Modern Bebek make ferreting under the pillow for a teeny tiny tooth a much easier affair. Small and personalised, with cute designs that kids will love, the tooth fairy bags ensure that those teeny tiny baby teeth make it safely into the hands of the tooth fairy, and that the cash they are exchanged for, makes it safely into the hands of your child. Or keep them for the “fairy” to stash all the teeth in as they’re collected and return them to your child on their 21st birthday! At just $9.95, they make a great gift idea too. 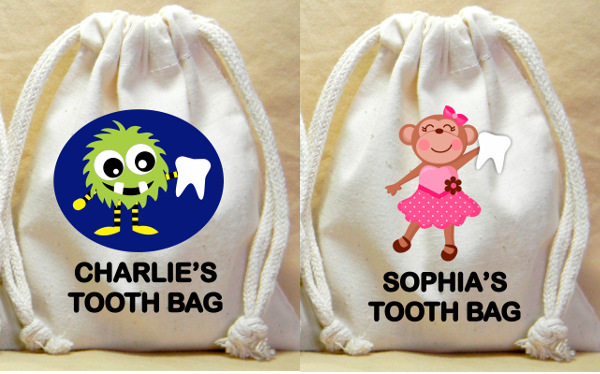 The tooth fairy bags, and other personalised goodies are available from Modern Bebek. Check our previous posts for more great tooth fairy finds, including this sweet miniature tooth fairy letter.